Mema (Luke's mom) made Elli an I Spy Blanket for Tot School. 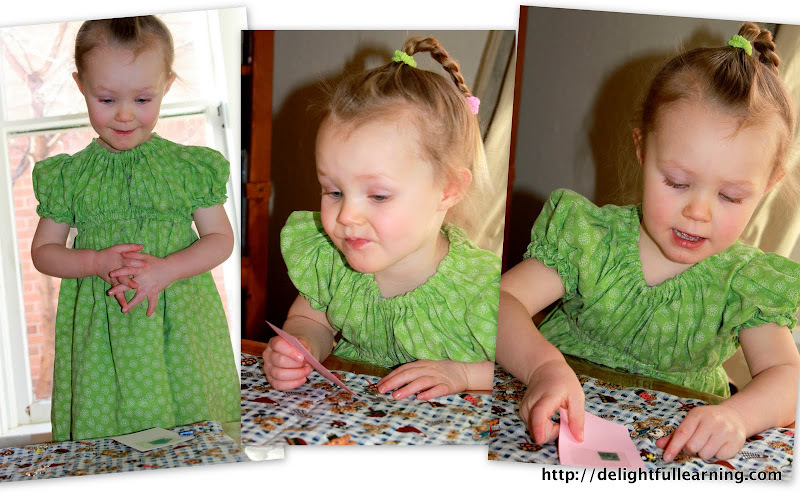 She sewed little trinkets all over a small quilt and then color copied the trinkets to make a set of I Spy cards. I was not sure if it would be challenging for her, but it was! She was quite stumped at times and I helped her a little by giving her clues. The first time she played, she selected the cards that she wanted to look for. It was so cute to watch her expressions and to see how pleased she was with herself when she found one. I was not planning to do Tot School this day, but she came down stairs in her "Tot School dress" that I sewed for her last summer and asked to do Tot School. I had been saving the blanket and also a puzzle for her, so I surprised her with these first. The following puzzle was a gift that Mema brought back from The Creation Museum at Answers in Genesis. I have mostly avoided puzzles because we just lose all the pieces anyways. 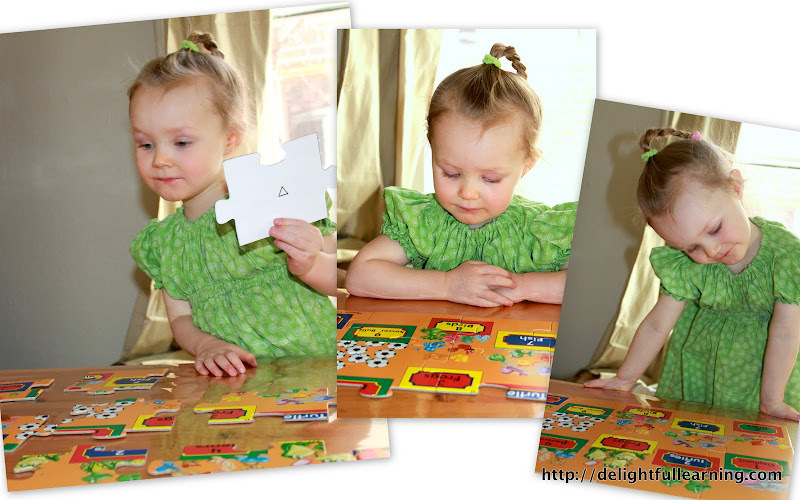 . . but I was happy to have it and Elli seems to have taken a liking to puzzles lately. 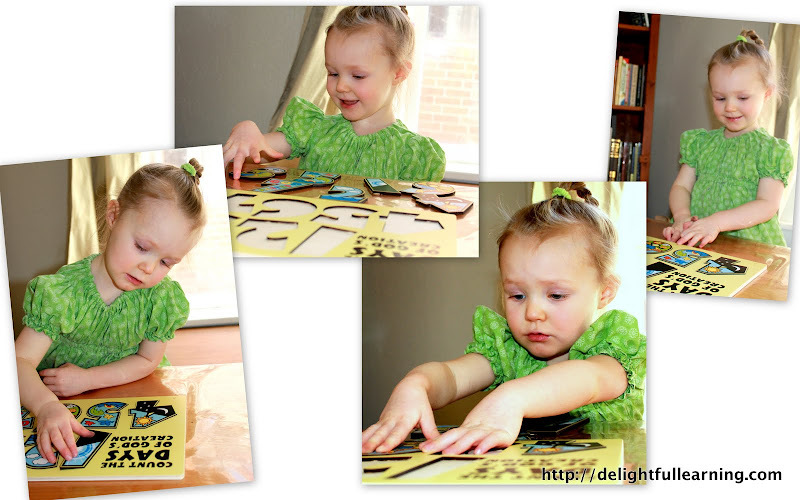 She also did a Melissa and Doug floor puzzle and then she did the Brown Bear puzzle again. Elli pretty much decided when she wanted to do tot school this week (and what she wanted to do). Another day she came down in another "tot school dress" (her sign that she wants to do tot school). She wore this dress all the time last summer and is wearing it in one of my favorite Tot School posts. Now, she has to wear it with a pair of pink cotton pants underneath. This day she told me she wanted to pour water. So, we gathered up various jars and cups and one large bottle filled with water. Which she filled up again herself. She wanted to fill the sifter with water on the tray and I asked her to fill it in the glass measuring cup and see what happens. It did not hold water much to her surprise! Mali also set up a tray and played next to her. He ran out of water first and she was so sweet to share her water - a tablespoon at a time! Then I asked her if she would help me pour water in the kitchen (after she changed out of what must have been a wet dress). She disappeared while I was cleaning up the water on the table and came back downstairs with a different shirt on (same pants). 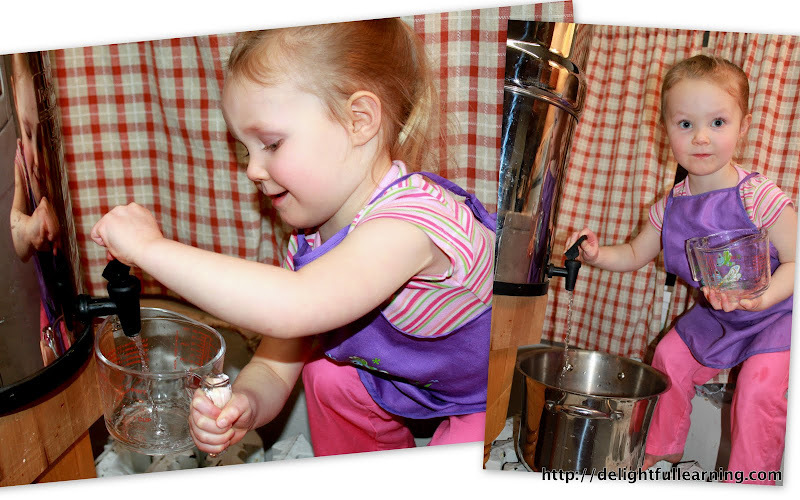 I asked her to help me fill the spaghetti pot with water from the Berkey. She was only filling it a 1/2 cup at a time so I let her put the pan under the spout so that I could get dinner going. 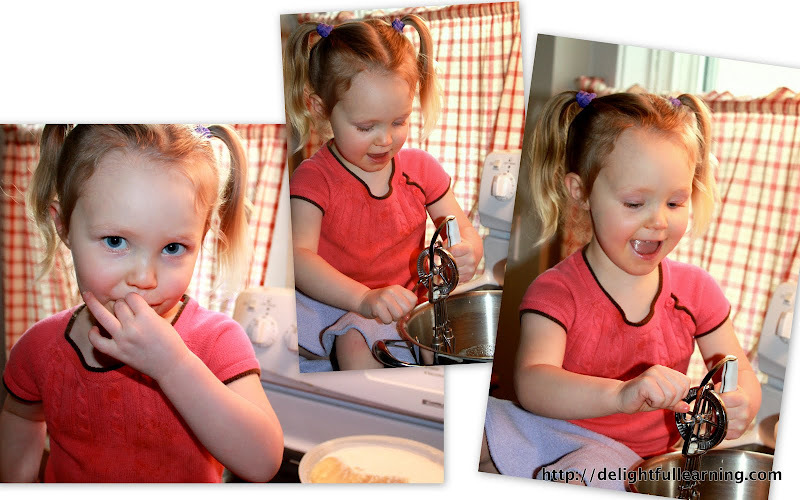 I love that she loves to help me in the kitchen. Although, it makes me nervous that she and Mali climb on the heater right next to the stove. I have taught them to always treat the stove top as hot. . . unless I set her on it, of course. I don't normally let her sit on the stove, but Mali was on the counter to the right of the stove and they both wanted to help. . .
Because I was making fudge (again). Can you see why they both wanted to be right there helping? The best part is that I only had to turn the burner on for a brief moment to just warm the pan to melt the coconut oil and it was already off when she came to help. 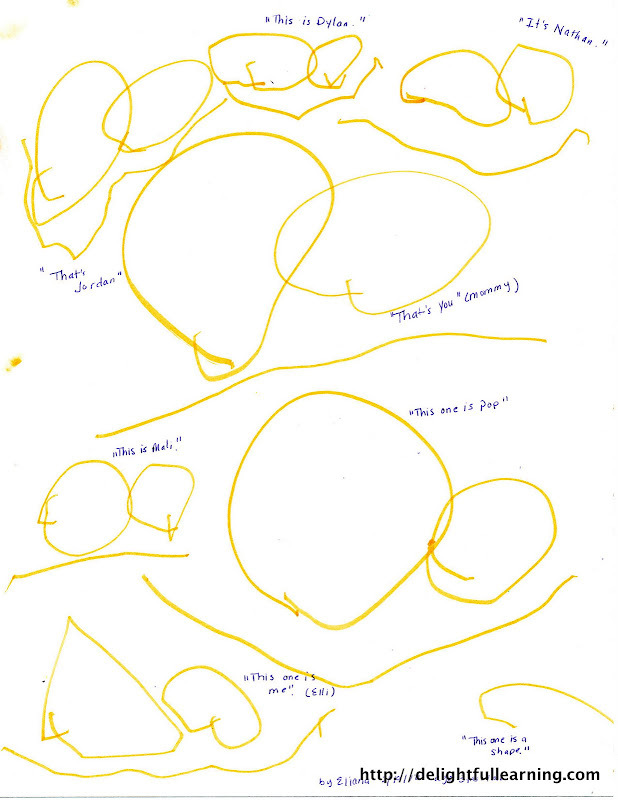 Elli drew this picture of our family this week. I thought it was so sweet! I wrote her little narrations as she told me about her family portrait. I think the highlight of Elli's week was swimming lessons. We have one more week of our second session. I love to sit and watch all the kids swim, but I stay closest to the side of the pool where Elli is. And she always watches to make sure I am there. I was so surprised to see the following shot! I honestly do not have any plans for tot school this week. My fabulous plan for blogging a week behind real time worked for the first couple of weeks only. I was not even sure I would be able to post this tonight. Mali started Kindergarten this last week and I have been putting much of my focus on the boys' school. I am thinking that I will keep Tot School real relaxed until summer time and then I hope to devote more time to planned activities. So, from here until the rest of this "school year," tot school may just be delight directed!